Manage work your way by keeping all project details in one place. 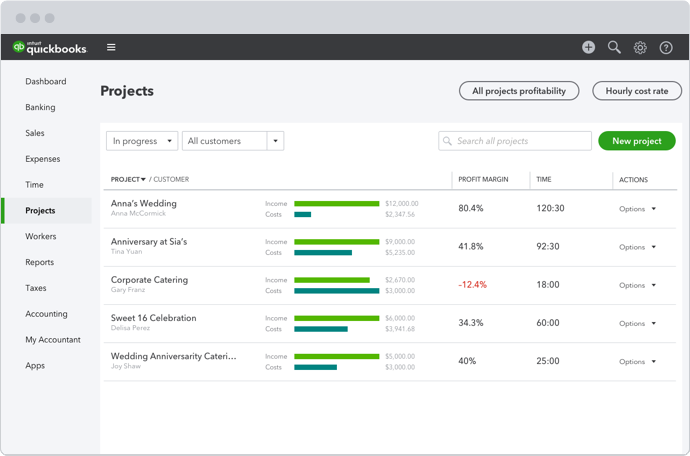 Easily track job and labor costs, expenses, and income to see how profitable your entire project is. Clear reporting helps you decide where to spend your time. See what QuickBooks can do for your business. Easily track job profitability with reports. Know exactly how much money your projects make with clear dashboards and reports. Track all time and expenses on your projects and view outstanding payments and unbilled work. Understand the full scope of a project by also tracking nonbillable time for each project. Why should I use projects? Projects gives you a central place to get a bird’s-eye view of your jobs along with all the associated transactions, notes, and reports. 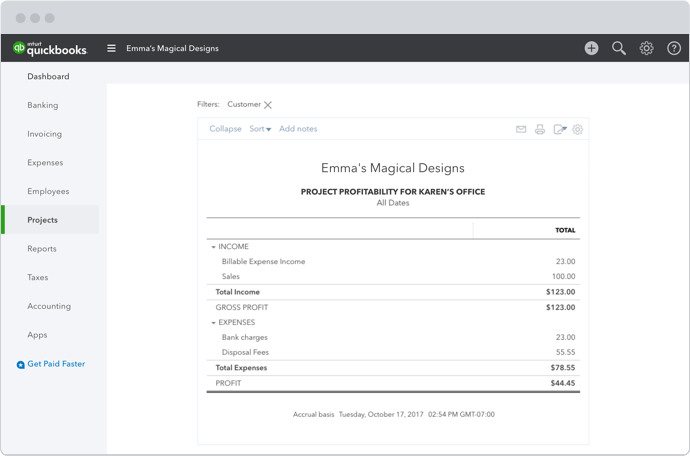 We’ve added four custom reports to help you easily see the profitability of your projects, invoices that need to be sent, sales transactions related to the project, and any nonbillable time. What project statuses can I set? There are three different project statuses: In progress, Completed, and Canceled. Just change the status to reflect what state your project is in. Can I budget by project? Yes, this is often used as a workaround for an estimate to project report. Create your budget, and select Subdivide by Customer, and then choose the project the budget is for. Based on TY15 subscribers that have identified >$0 in business expenses and of those users that have >$0 in tax savings and have logged between >0 and <250k miles. Beginning on Jan. 1, 2017, the standard mileage rates for the use of a car (also vans, pickups or panel trucks) will be: 53.5 cents per mile for business miles driven, down from 54 cents for 2016; 17 cents per mile driven for medical or moving purposes, down from 19 cents for 2016; 14 cents per mile driven in service of charitable organizations. These and other requirements are described in Rev. Proc. 2010-51. Notice 2016-79, posted today on IRS.gov.